Astronomers using the Atacama Large Millimeter/submillimeter Array (ALMA) have discovered a surprising connection between a supermassive black hole and the galaxy where it resides. 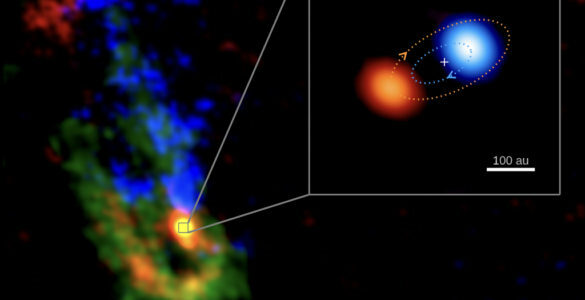 Powerful radio jets from the black hole – which normally suppress star formation – are stimulating the production of cold gas in the galaxy’s extended halo of hot gas. 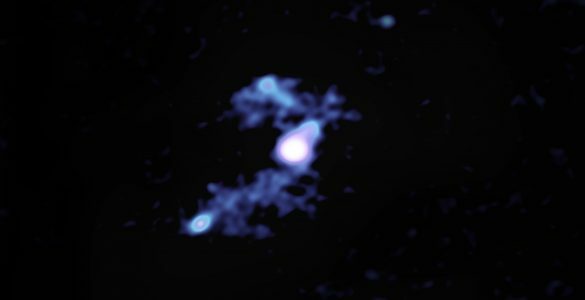 This newly identified supply of cold, dense gas could eventually fuel future star birth as well as feed the black hole itself. 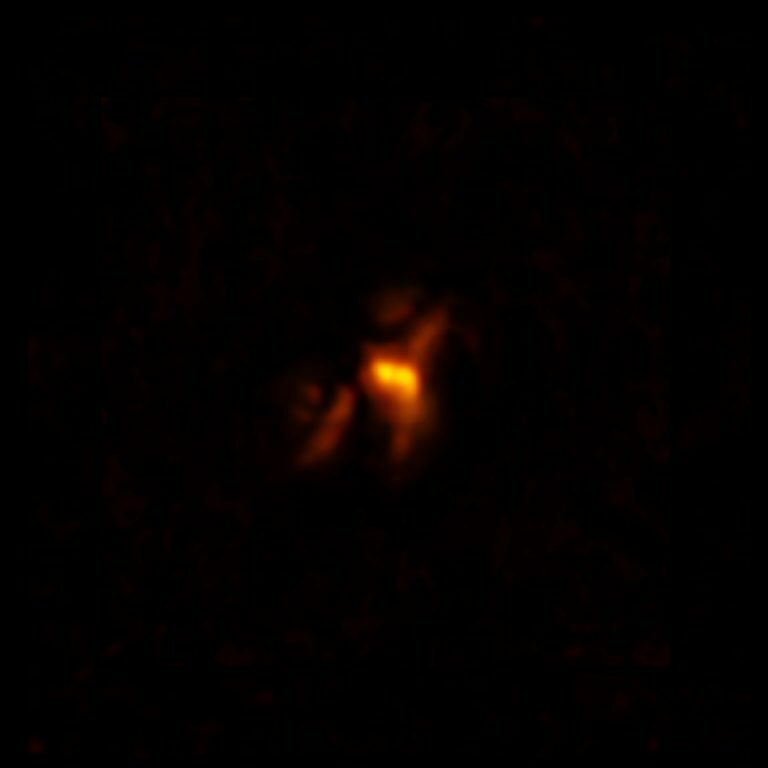 Earlier research with NASA’s Chandra X-ray observatory revealed that the jets from this AGN are carving out a pair of giant “radio bubbles,” huge cavities in the hot, diffuse plasma that surrounds the galaxy. Without a significant source of heat, the most massive galaxies in the universe would be forming stars at extreme rates that far exceed observations. 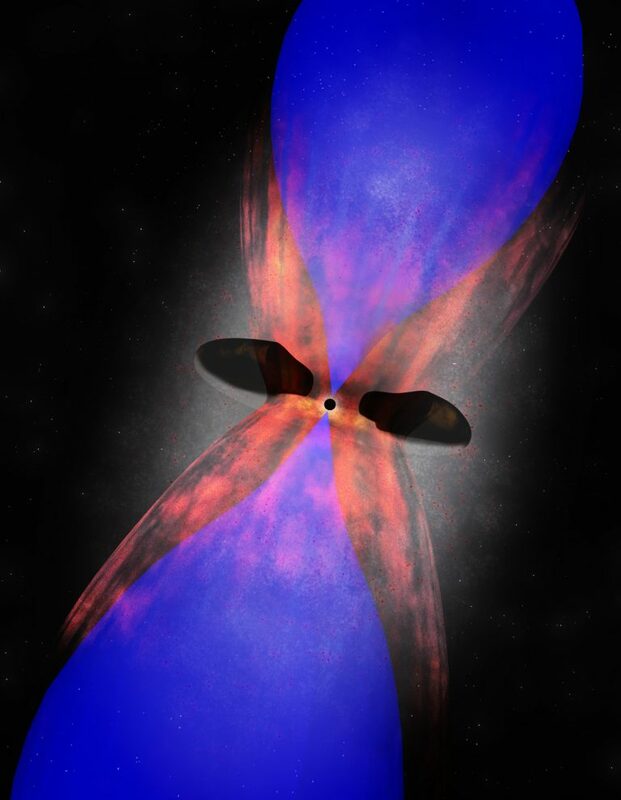 Astronomers believe that the heat, in the form of radiation and jets from an actively feeding supermassive black hole, prevents overcooling of the cluster’s hot gas atmosphere, suppressing star formation. This story, however, now appears more complex. 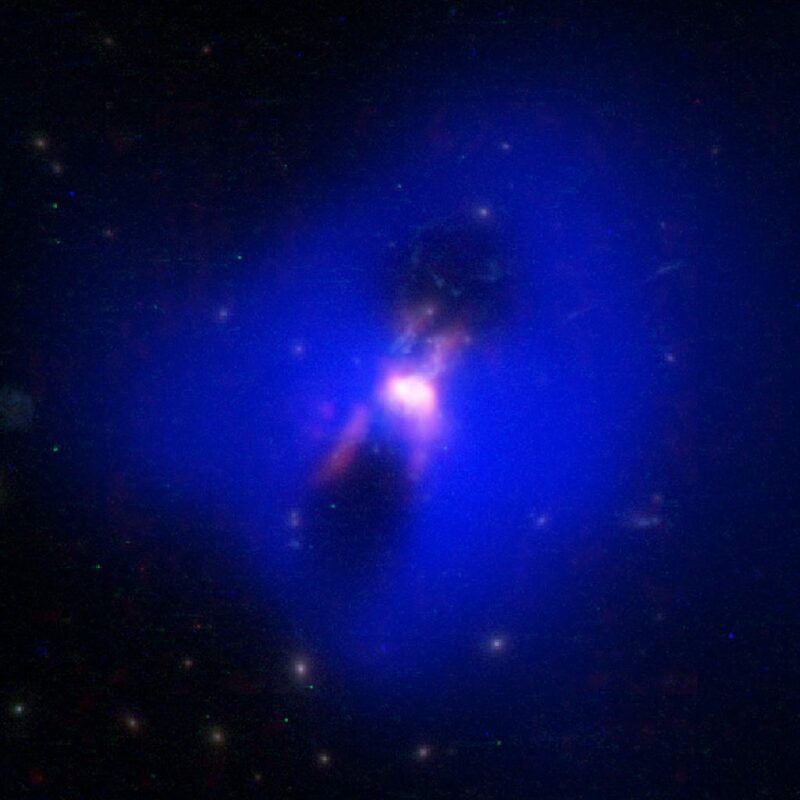 In the Phoenix Cluster, Russell and her team found an additional process that ties the galaxy and its black hole together. 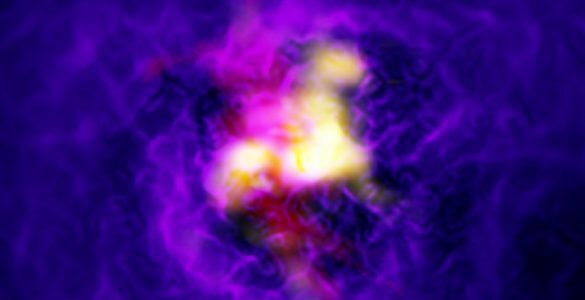 The radio jets that heat the core of the cluster’s hot atmosphere also appear to stimulate the production of the cold gas required to sustain the AGN. This result helps astronomers understand the workings of the cosmic “thermostat” that controls the launching of radio jets from the supermassive black hole. “This could also explain how the most massive black holes were able to both suppress run-away starbursts and regulate the growth of their host galaxies over the past six billion years or so of cosmic history,” noted Russell. This research is presented in a paper titled “ALMA observations of massive molecular gas filaments encasing radio bubbles in the Phoenix Cluster,” by H.R. 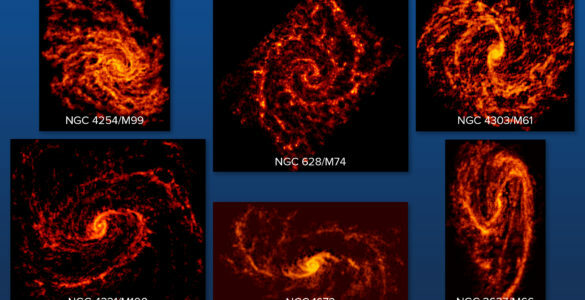 Russell et al., published in the Astrophysical Journal [http://apj.aas.org]. Composite image showing how powerful radio jets from the supermassive black hole at the center of a galaxy in the Phoenix Cluster inflated huge "bubbles" in the hot, ionized gas surrounding the galaxy (the cavities inside the blue region imaged by NASA's Chandra X-ray observatory). Hugging the outside of these bubbles, ALMA discovered an unexpected trove of cold gas, the fuel for star formation (red). The background image is from the Hubble Space Telescope. ALMA image of cold molecular gas at the heart of the Phoenix Cluster. The filaments extending from the center hug enormous radio bubbles created by jets from a supermassive black hole. This discovery sheds light on the complex relationship between a supermassive black hole and its host galaxy. Artist impression of galaxy at the center of the Phoenix Cluster. 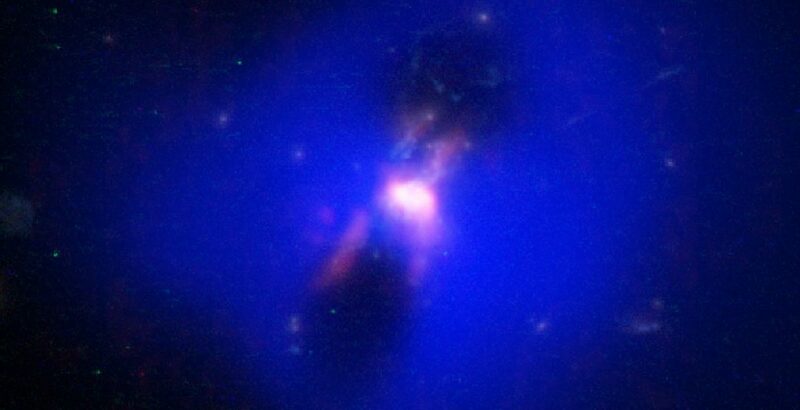 Powerful radio jets from the supermassive black hole at the center of the galaxy are creating giant radio bubbles (blue) in the ionized gas surrounding the galaxy. ALMA has detected cold molecular gas (red) hugging the outside of the bubbles. 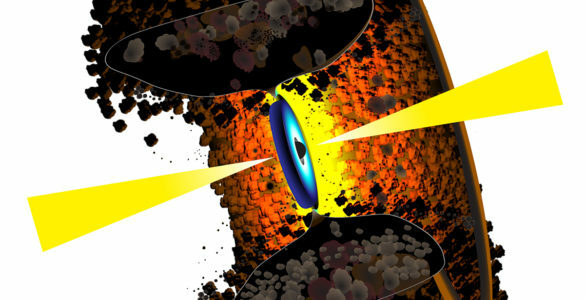 This material could eventually fall into the galaxy where it could fuel future star birth and feed the supermassive black hole. Video explaining the complex relationship between a supermassive black hole and its host galaxy.